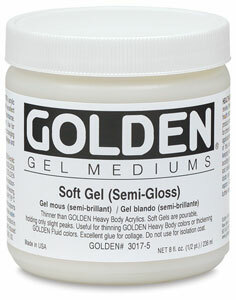 Soft gel medium is an amazing acrylic medium that can take your paint game to the next level. The special thing about this medium is that it's simple. It's not going to change the paint too much. It won't slow the drying time down or self-level. It's just a really good staple if you are an acrylic painter and it's a bit of a "gate-way" medium - as in it may lead to use of more extreme medium usage! - Extends your paint - saving you some serious bucks! - Slightly thinner consistency than heavy body acrylics, so it brushes out very smoothly. - Still holds brush strokes as you brush out paint film. - Increases transparency of the paint film. The more medium you add the more sheer the colour application is -which allows you to experiment with showing and obscuring different colours and images on the layer beneath. - When thinned with water soft gel medium is used to create an isolation coat before final varnish layer is applied.